Summer is officially here...and so is the heat! Hopefully you're cooling off at the beach, or staying inside with the air-con on full blast. Did you know there are designated cooling centers around the Los Angeles area? This year we've made a conscious effort to cut down on any waste we produce. We avoid buying produce that's packaged and try to make things from scratch when we can. Our boxed milk alternatives have been one of the last things to go, although for years I've complained about the additives in these milks. Even if you buy the more "natural" ones, they still have some sort of binder and tend to be very pricey. I wish I hadn't waited so long! Homemade nut milk, of any kind, is easy to make and tastes fresh and delicious. And, one cup of almonds can yield over three cups of milk! We calculated the cost of making our own, and it's just under a dollar (about 78 cents). Not to mention, you can use the leftover almond pulp to make energy balls, face scrub or almond flour. Making your own nut milk does take some forethought; you have to soak the almonds for about 8 hours. Although I've read that you can soak them in hot water for an hour, but haven't tried this method yet. Let me know if you do! This recipe is so simple, and you really only need some almonds, water and a dash of salt. But if you have the opportunity, why not jazz it up? I usually add a date or three, if I'm feeling sweet, or sometimes cinnamon or honey in lieu of dates...ginger, anyone? As always, get creative and follow the lead of your own taste buds. Almond milk is delicious on top of homemade granola, it can also be used in baking as a substitute for dairy milk, or enjoyed on it's own with a little dash of cinnamon or blended in a smoothie. Bon appetit! 1. 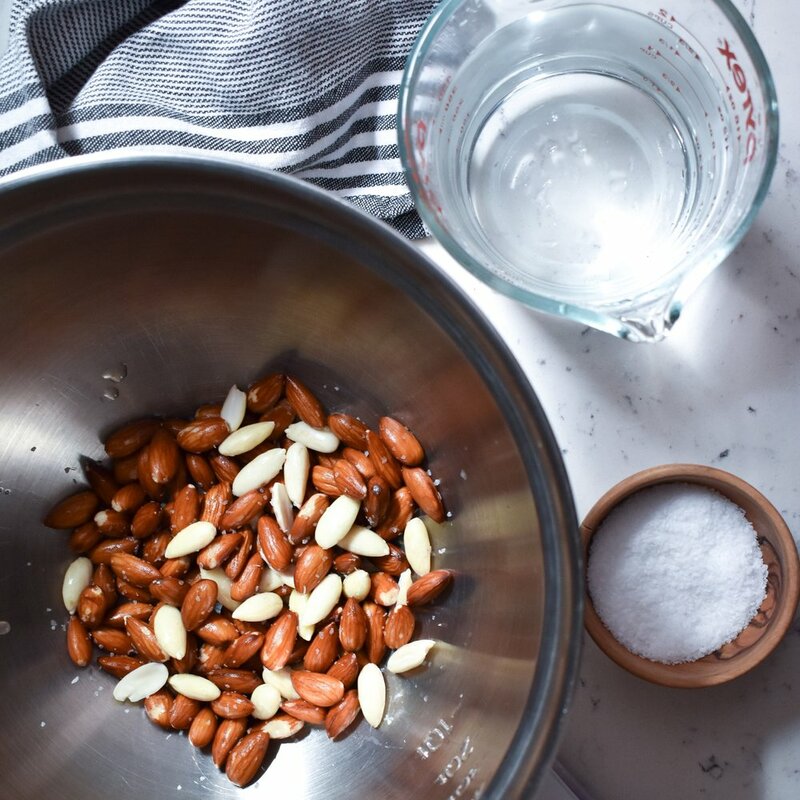 Rinse the almonds in a colander and place them in a bowl or jar. Cover (at least 2 inches) the almonds in cold water and soak overnight, or between eight and twelve hours. 2. After soaking the almonds, rinse them with water and set aside to drain. 3. Combine the almonds almonds, water, salt and date(s) into a blender or large mixing bowl if using an immersion blender as pictured above. Blend on high speed until the mixture forms a relatively smooth liquid (about one minute). 4. 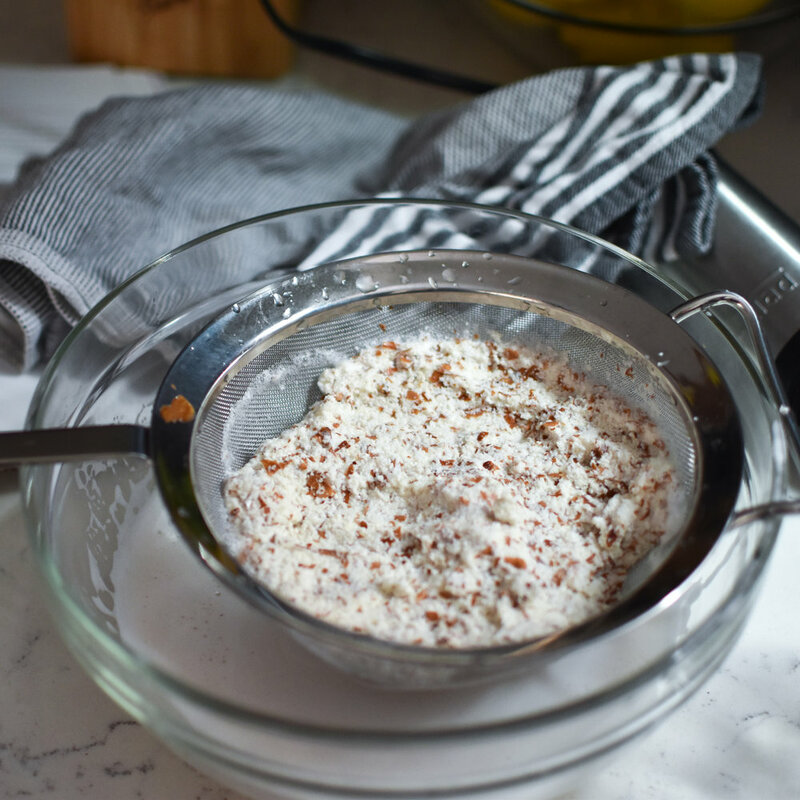 Place a fine sieve or colander and cheese cloth over a mixing bowl and pour in the the almond mixture and allow it to drain into the bowl. After allowing the liquid to drain out, gently press the remaining *almond pulp with your hands and squeeze out any excess liquid. 5. Store the almond milk in the refrigerator for up to five days. Because there are no additives, the almond milk will naturally separate--just give it a few shakes before using. Enjoy! * Don't discard your leftover almond pulp! You can use it to make these energy balls or even face scrub! You can also dehydrate the pulp to make almond flour. The almond pulp can be stored in the refrigerator for up to three days or in the freezer for one month.